Maintenance Connection, a leading provider of browser-based Enterprise Maintenance Management Solutions, is pleased to announce the release of a Mobile CMMS tablet based version of their MC Mobile Wireless Edition. The Mobile CMMS Tablet Edition is a valuable work flow management tool that provides technicians with quick access to work orders and key maintenance data from the field. The Maintenance Connection Mobile CMMS Tablet Edition was developed in response to the increased availability of larger and more interactive mobile devices that provide users with bigger screens, as well as touch based interfaces. Functionality includes options for members to view and edit open work orders, as well as create new requests when needed. Members can update inventory, have the ability to view asset details, asset history, and make edits when necessary. The application is very user friendly, with icon driven screens and a smooth flow. For example, the Work Order List is especially easy to read and navigate, providing technicians with quick access to their assignments. 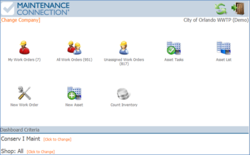 Once a work order is selected, technicians can easily view icons to access tasks, material costs, inventory counts, history, assignments, labor costs, and areas to enter information required to complete the work order. Maintenance Connection connects maintenance personnel to extend asset lifecycle, track maintenance costs, prevent and predict equipment failures, improve labor productivity, reduce costly equipment downtimes, minimize investments in inventory, and lower the total cost of maintenance. Our unique combination of cutting-edge CMMS/EAM technology and emphasis on service excellence has led to thousands of satisfied users worldwide. We anticipate holding our Fall Checkpoint Training Seminar sometime in October.